In case of “In the Field” accidents. Also reflective and other safety equipment. 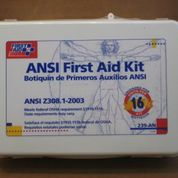 FAK : This First Aid Kit exceeds Federal OSHA requirements 1910.151 and ANSI Z308.1-2003. It is recommended for offices up to 25 people. EW-8: Bottle of 8-oz irrigate sterile isotonic buffered eyewash. The bottle has factory-sealed cap to maintain the integrity of the product. The eyewash station is available – price upon request. EW-16: Bottle of 16-oz irrigate sterile isotonic buffered eyewash. The bottle has factory-sealed cap to maintain the integrity of the product. The eyewash station is available – price upon request. EW-32: Bottle of 32-oz irrigate sterile isotonic buffered eyewash. The bottle has factory-sealed cap to maintain the integrity of the product. The eyewash station is available – price upon request. A69R-W: White hardhat with ratchet type adjustment band for superior fit with infinite adjustment. One size fits all. This hard hat meets all ANSI Z89.1 Class A, and OSHA regulations for the industrial head protection. TSC: 12″ Florescent orange traffic safety cone. 2000C: “Pelican” high impact, 3 c-cell flash light with laser sot xenon lamp module. Belt spring clip and black lanyard. (Batteries not included) Available in Black, Yellow, and Orange. 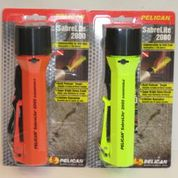 Batteries for 200C Pelican flashlight available. 340-6004: Ear pods for hearing protection. 311-1252: Soft corded ear plugs for hearing protection. A144: 6×10 Absorbent Pads that will absorb the allowed 2 oz. of the fuel samples in case of breakage. M71-200: Large 16″ x 18″ dimple finished pads packaged 200/per box. This is a much larger, heavier, and sturdier absorbent pad than the A144. Resists shredding, absorbs petroleum only.